The Consumer Product Safety Commission (CPSC) has implemented comprehensive new safety standards for baby cribs. The standards ban the sale of dangerous drop-side cribs and improve safety testing to prevent infant strangulation deaths. The regulations took effect this week after the recall of over 11 million unsafe cribs since 2007. Over the past decade, at least 32 infants have suffered suffocation and strangulation deaths in defective baby cribs. The CPSC is calling the new regulations the “most stringent crib safety standards in the world.” The standards are important for parents to learn because the CPSC reports that even cribs without drop-sides are unlikely to meet the new standards. The standards work to prevent infant deaths in several ways. In addition to banning the manufacturing or sale of drop-side cribs, the standards strengthen mattress supports and crib slats, make testing more rigorous and require crib hardware to have anti-loosening devices. All importers, distributors, manufacturers and retailers must comply with the regulation immediately. Many large retailers such as Target and Walmart say they have already stopped selling drop-side cribs. Certain businesses using cribs have a grace period for compliance: in-home child care services, child care facilities, rental companies and public accommodations such as hotels. The CPSC said parents who want to keep using drop-side cribs can contact their manufacturer and ask if they offer an immobilizer. These devices secure drop-sides to prevent the crib from separating and causing an infant injury. Parents with other types of cribs are urged to check their cribs as well. One of the reasons other cribs are unlikely to comply is the new standards require stronger wood and other materials. 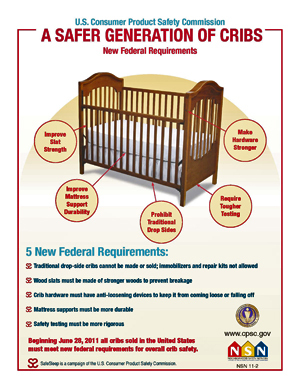 Parents who continue to use their existing cribs are urged to monitor recalls on the CPSC website at www.cpsc.gov.